* It fits out 50,55 and 60 inch tv perfectly with a lot of room to spare. * Scalability: can be adjusted to fit the length you need. * Flexibility: to change the look as you want, offer so many design choices. * Two separated L-shaped shelves in one package. * Weight capacity up to 75 lbs, easy to assemble, modern and budget friendly. 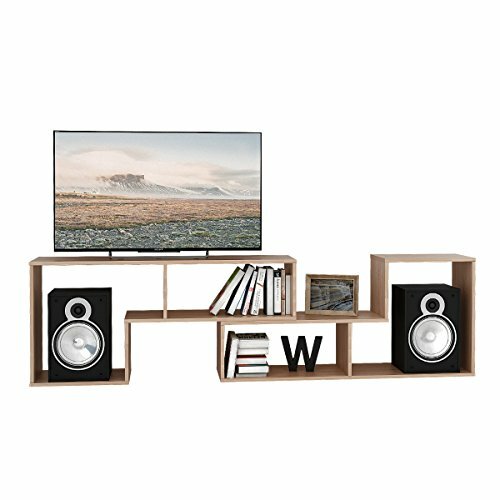 Versatility: This shelf can be used as TV stand, bookcase and display cabinet. Maximum holds 60" TV. Two separated L-shaped shelves in one package. Unit Dimension: 43.3"W x 11.7"D x 20.1"H.
Weight capacity up to 75 lbs,easy to assemble. Eco-friendly MDF board with melamine facing is scratch resistant and easy clean.